To play DVDs on macOS Mojave, you need a Mac with a built-in internal drive or an external drive, a DVD player app, and playable DVDs. A good news for millions of Mac users who own some DVDs is that Mojave comes with an updated 64-bit DVD Player app with a new icon and UI. The app supports cool features including cool Touch Bar and Dark Mode as well. Here are some tips and advice for playing DVDs on macOS 10.14 Mojave using the updated player app. Surely, you can use other DVD players for macOS Mojave like VLC Media Player. The 13-inch non-Retina MacBook Pro is the last Mac with a built-in CD/DVD drive. If your Mac computer has no internal optical drive, use an external optical drive such as Apple USB SuperDrive priced at $79. 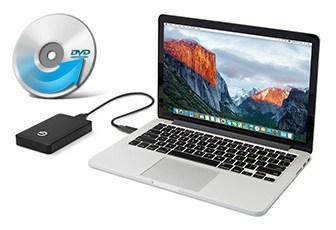 Check our list of best external DVD/CD drive for Mac. Tips: Mac has a Remote Disc feature, making it possible to share discs from the drive of another Mac, or from a Windows computer with DVD sharing setup installed. Here's the guide to sharing discs from another computer and play DVDs on macOS Mojave based MacBook Air/Pro/iMac without DVD drives. Another way to go is to make your DVDs digital. You need a program to rip DVDs to MP4, MOV, M4V, hard drive, USB drive etc. on Mac, and a DVD drive is also needed for the job. Once it's done, you can view DVDs on Mojave anytime and anywhere without a DVD drive. Insert the DVD disc you want to play into the internal drive or optical drive connected to Mac. If you are using Apple USB SuperDrive, according to Apple support, it only accepts 120-mm round DVD discs. The 64-bit DVD player for macOS Mojave will recognize the disc quickly and start playing the disc. To make the disc play automatically when the app opens, go to DVD Player > Preferences > Player and choose Start Playing disc next to When DVD Player opens. * Some DVDs have several chapters, you can select the one you'd like to watch. To do so, click Go > Chapter and pick the chapter from the menu to view. * About DVD region code - Most of the DVDs sold on Amazon.com are encoded for Region 1 or Region A. to play a region-locked DVD on macOS Mojave, the region code should be the same as that of the DVD drive. After inserting the DVD disc, in DVD Player, click File > Get Disc Info > Regions, and you'll see the DVD region. If you are asked to change the DVD region, select a region that matches the DVD region. Note that you can only set the region code for DVD drive five times. So some users choose to remove the region code from DVDs using DVD decrypter software. * DVD Player app won't recognize a disc. Some users said the DVD they insert kept getting ejected. Why won't the Mac read a DVD? It may be a sign of a dusty DVD drive, try cleaning the lens of the drive. If the problem still exists, try another quick fix - a PRAM reset. * DVD won't eject on Mojave. " I tried to eject the disc but it is locked, and I can't unlock it. What to do now?" Make sure you are using the right way to eject a DVD from the desktop or from a Finder window. For users who have issues that DVD won't play on macOS Mojave, for example, the 64-bit DVD player quits unexpectedly, the disc is not available, DVD playing freezes, please read our complete solutions to DVD not playing on Mac. *The 64-bit DVD Player app doesn't play encrypted video folders and ISO images from DVD discs. * Blu-ray discs and content burned onto some DVD-RW discs are not accepted either. * The DVD Player app on macOS Mojave is prevented from mirroring because of copyright. Reliable 64-bit DVD ripping software like MacX DVD Ripper Pro is essential for more convenient DVD playback on macOS Mojave. Such tool lets you copy commercial DVDs (as well as encrypted DVD video folders, ISO images), including 99-title DVDs, Disney DVDs, Region-locked discs, damaged or other unplayable DVDs to MP4, MOV, M4V, digital video formats. You can transfer the ripped DVD movies to hard drive, USB drive, NAS, cloud etc. for storing, sharing and easier playing without a DVD drive. View DVDs on Mojave requiring no DVD drive, and you don't have to insert and eject discs over and over again. Play encrypted DVD Video_TS folder and ISO images on macOS. Watch damaged and region-locked DVD movies freely. Disclaimer: If the DVD discs are copyright protected, it's illegal to decrypt them. We do not encourage the sharing and reproduction of copyrighted materials. 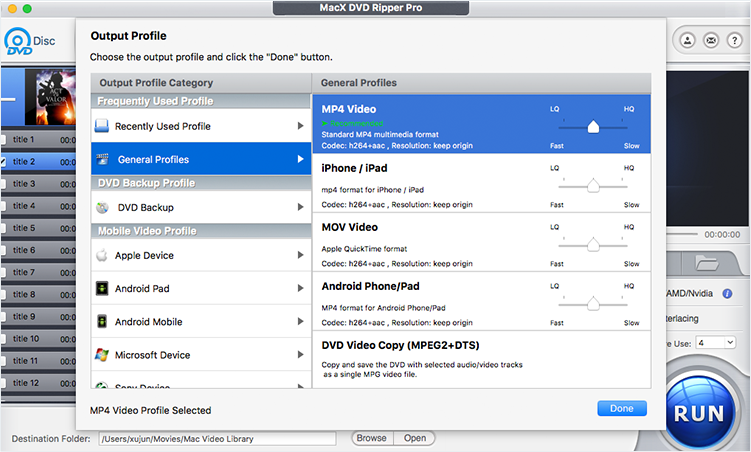 MacX DVD Ripper Pro lets you copy 99-title DVDs, region-locked DVDs, unplayable/damaged DVDs, any type of discs, DVD video folders to MP4, MOV, M4V etc with high quality. Thus, you are free to view DVD movies on macOS Mojave without a DVD drive anytime and anywhere. Check the best free DVD decrypter software. Copy DVD Discs to MOV Video Format on macOS. Guide to copying protected DVD movies to DVD. Know the basic information of DVDs.